Ryan Landry of Landry/French Construction of Scarborough finishes off some detail work on the new Bangor Savings Bank branch on Allen Avenue in Portland in January 2011. 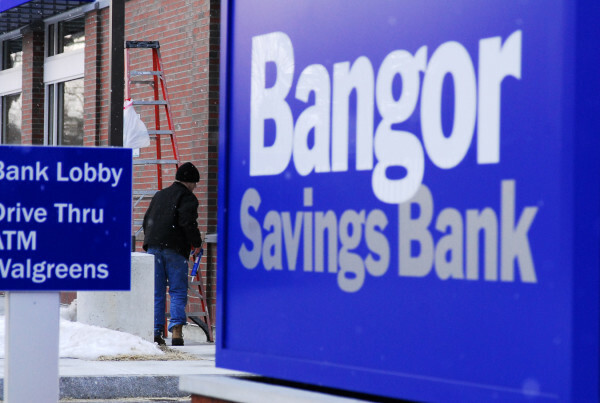 PORTLAND, Maine — Bangor Savings Bank has set a wage floor of $13 an hour for all employees, a move the bank said will give about one-third of its employees a raise. The bank’s “living wage initiative” means 240 of the bank’s 740 employees will get a raise, according to Carol Colson, a senior vice president at the bank. The bank said it has increased its entry-level pay over the past two years, putting the $13-an-hour rate into effect this year. That starting wage works out to $520 per week for a full-time employee. Across all jobs in commercial banking, the average weekly wage was $1,038, according to figures compiled by the Maine Department of Labor.